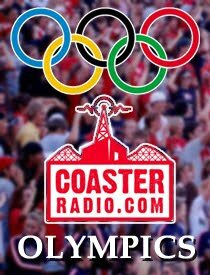 CoasterRadio.com #443 - Bert the Conqueror and Fireworks! 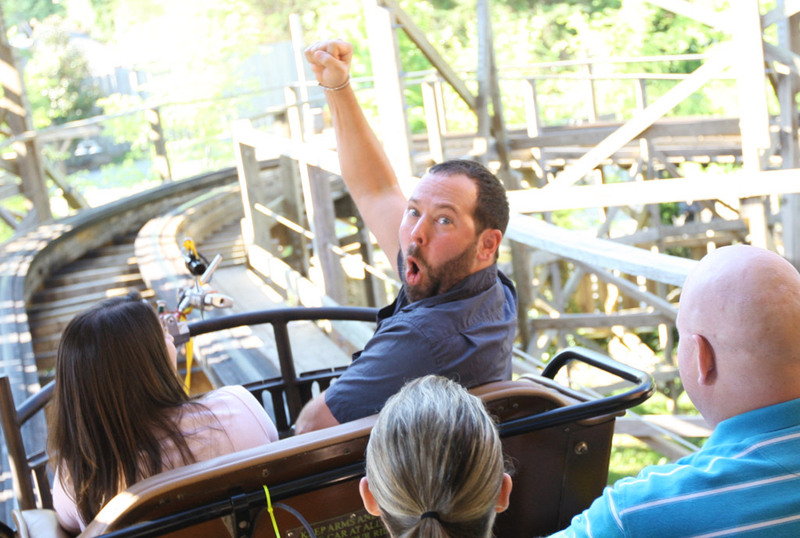 On this week's show, we welcome the host of The Travel Channel's hit show "Bert the Conqueror," Bert Kreischer! Bert and his crew are in the middle of producing the first season of this new show that takes viewers to the legendary attractions, competitions and adrenaline rushes that you can find all across America. He joins us from the road to tell us about what he's experienced so far and what crazy feats we can expect to see in the upcoming months. He'll also tell us about whether he really is terrified to experience all of these thrills or if he is just delivering some academy award winning acting. 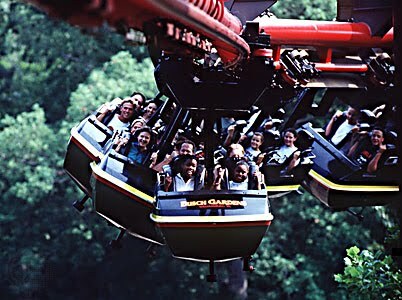 Plus, you'll be surprised to hear which amusement operators are asking for his advice about future attractions. All that, plus a live trip report from Six Flags Magic Mountain and a surprise guest! One of the coolest features is the video camera that shoots 720p video and comes with iMovie editing software. Of course, we here at CoasterRadio.com believe that all of our listeners should be using the iPhone to shoot Live Trip Reports when they're at the parks. Kevin from Ohio shows us exactly how it's done with this video! Watch, listen and learn from the master! Nice job Kevin! Zach was one of the lucky few to participate in the commercial shoot for Kennywood's new roller coaster "Sky Rocket." He was able to ride it before it has opened to the public! Cool! But he also took time to take some creative shots for our latest contest! Ghostwood Estate has been taken over by The David Arquette Project! 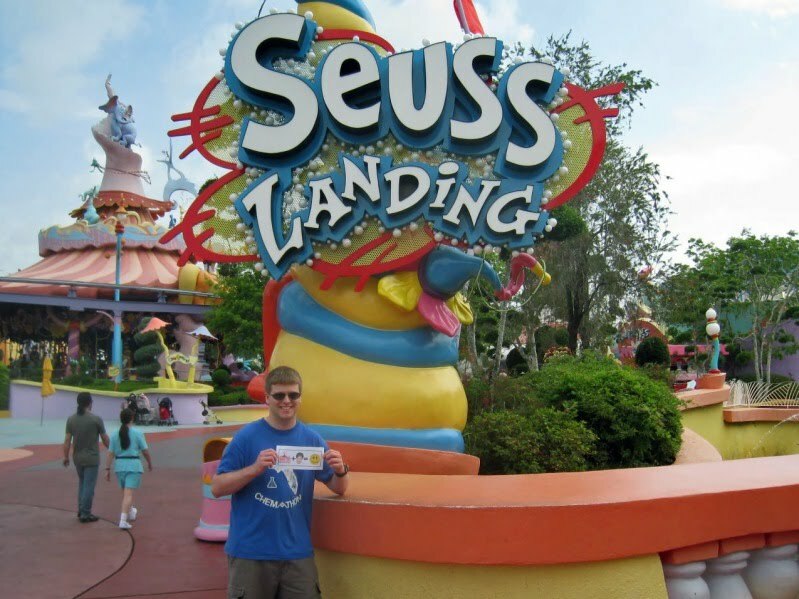 Tom was one of the first people to visit the new Wizarding World of Harry Potter at Universal Studios Islands of Adventures. After checking out Hogsmeade Village and Hogwarts Castle, Tom stopped by Hagrid's Hut to visit our friend from the podcast. Unfortunately, Hagrid must have been out walking the grounds. 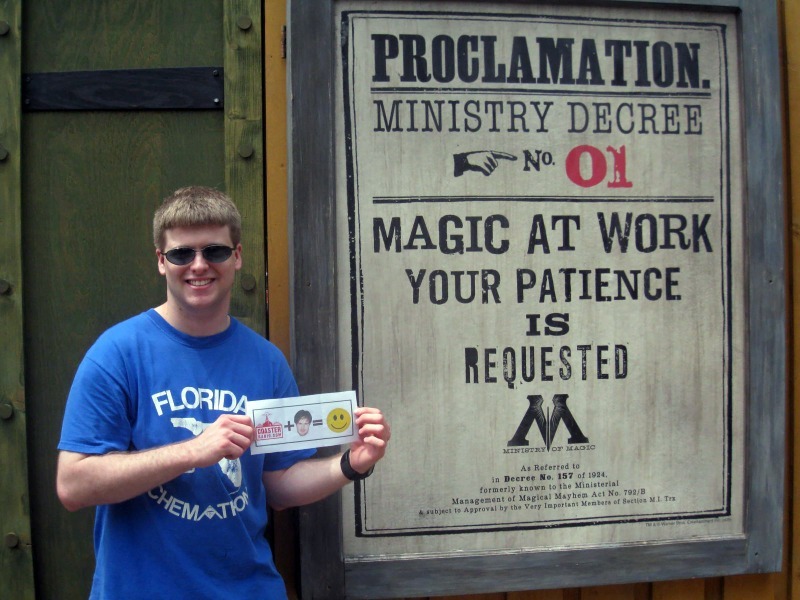 But Tom took some time to pose in front of Hagrid's house with the Arquette Arithmetic photo! The David Arquette Project rolls on... this time in the beautiful city of Tampa, Florida! Our good friend Andrew (better known to the world as JumboShrmp) went on a behind the scenes tour of all of the roller coasters at Busch Gardens Tampa. 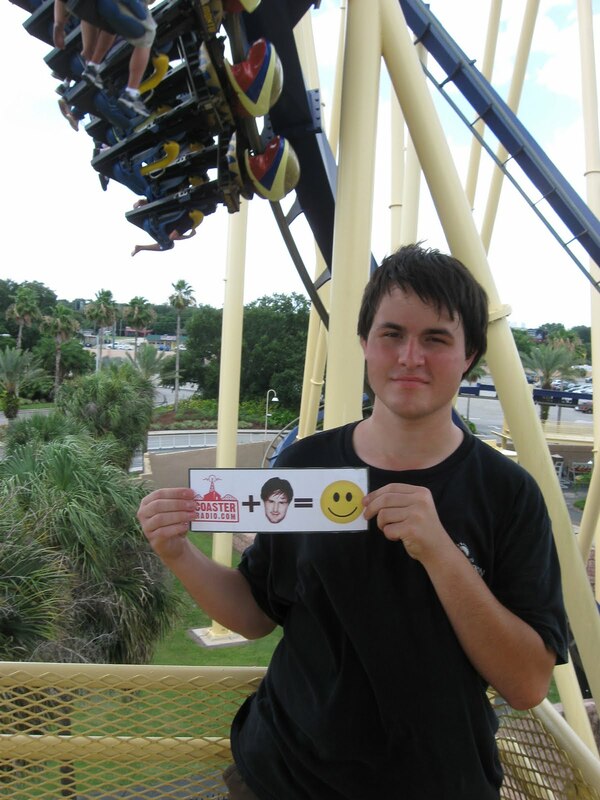 While he was up on Montu's mid-course break run, he asked the Busch Gardens staff to snap this picture with the Arquette Arithmetic image. The cool thing about this photo is that you can't get this shot from any place on the midway! You arrive at the park with your friends and/or family and everyone seems to be in a great mood. Someone suggests to hit the biggest and baddest coaster in the park right away. Only problem is, when you reach the queue, you begin to see the fear in one of your comrades eyes. Not the simple, "I'll conquer this" fear, but the, "no way, no how," kind of fear. How do you prevent your buddy from running for the exit before you even reach the loading platform? One sure fire way to scare them even more is to pressure them into hopping on board before they are ready. Calling them a pansy is only going to tick them off. Try being supportive and let them know that you're all in it together. If it's someone else's first time in your party, have them sit together so they can have someone to relate to. If the timid friend is an experienced coaster rider, remind them of all of the previous coasters they've conquered before. Tell them that if they went 200 feet, 300 feet won't feel much different. If they've reached a speed of 70 MPH, they won't even notice 10 MPH faster. It may also help to talk about the fun they've had riding coasters before. Recently I stood in front of a girl in line who actually preferred to not talk about her fears at all. She needed to internalize her fears and block out what she was about to do. If all else fails, give your pal a break. Allow them to sit this one out without giving them a hard time. Maybe they just need a few warm up coasters to get them motivated. Ask them later in the afternoon if they'd like to give it a shot. Just remember... be encouraging! Not pushy! CoasterRadio.com #442 - Wizarding World Wackiness! July 17, 1955 was a famous day in theme parks lore. It was the day of Disneyland's Grand Opening. 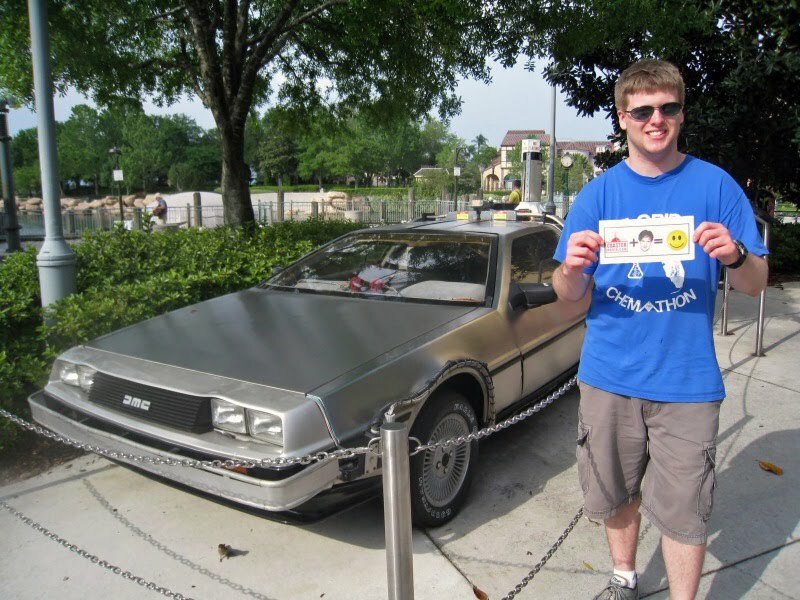 Will June 18, 2010 be a similar day in theme park history? 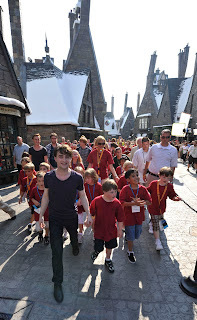 This was the day The Wizarding World of Harry Potter opened at Universal Orlando's Islands of Adventure. There hasn't been an new land opening in recent memory to attract as much excitement and anticipation as the Wizarding World. 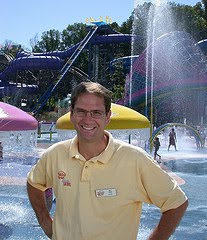 On this week's show, EB and Mike welcome Arthur Levine, the theme parks guide from about.com. 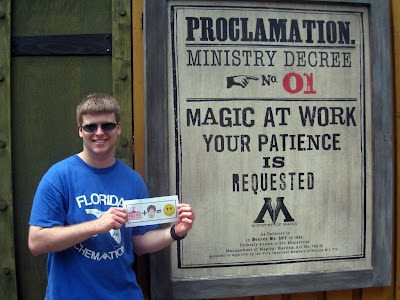 Arthur just got back from spending a few days in Orlando for the Grand Opening of the Wizarding World and he has details about the attractions, stores, crowds and surprises that await Muggles who travel to Hogsmead Village and Hogwarts Castle. 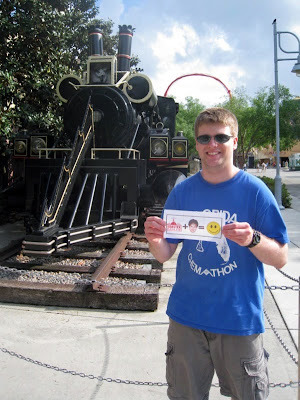 The guys also hear from one of their listeners who calls the CoasterRadio.com hotline to deliver a live trip report. Is the Frozen Butterbeer already a legendary drink? Plus, EB and Mike are visited by their resident half-giant, Hagrid. It turns out Hagrid prevented a huge disaster from happening on opening day. Will it be enough to convince Universal Orlando personnel to let him back into his hut? 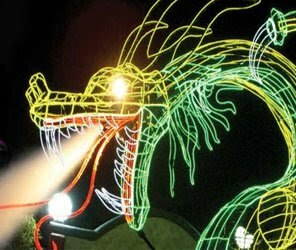 It's POTTERMANIA, this week on CoasterRadio.com! 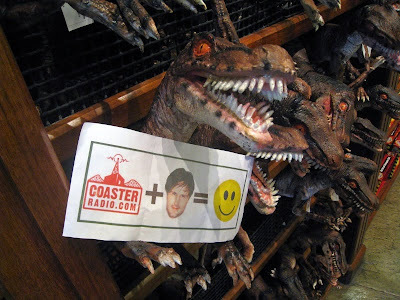 On this week's show, we're going to talk about legendary coasters. 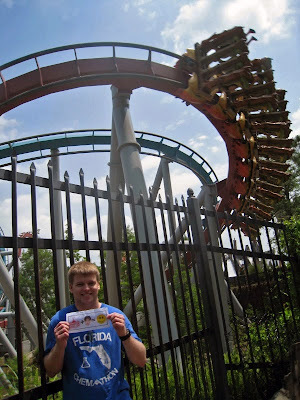 Specifically, we're going to talk about legendary coasters from the past and also legendary coasters that are still giving great rides today. 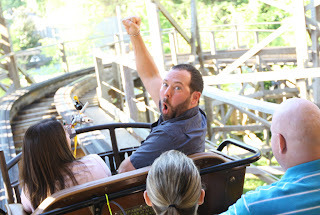 Give us a call at 206-339-3360 and let us know about two roller coasters that you think are legends. We're looking for some good answers for our next show! Here are the different ways to get on the show! Earlier this year, we started the "Being David Arquette" contest, where we asked CoasterRadio.com listeners to re-create a scene from a David Arquette movie. 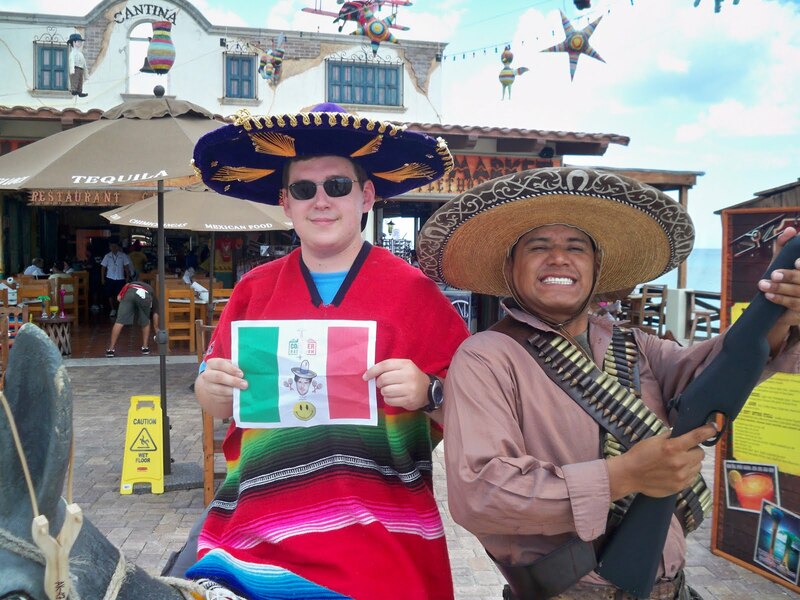 Here is the brilliant entry from Travis. Listen to next week's show to find out what we decide to do with this contest! Nice job Travis! 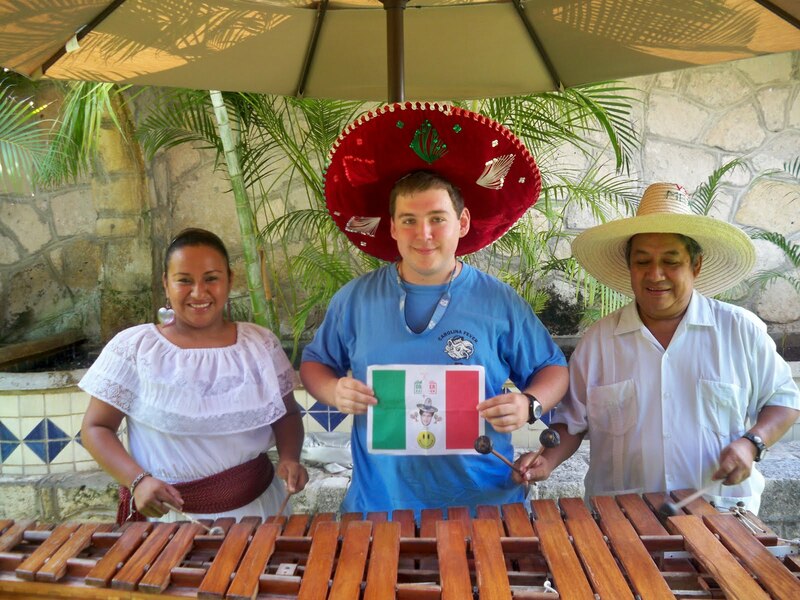 Andrew spent a few days in Orlando and then headed South of the Border to spend some time in Mexico. He added some creativity and cultural flair to his entry by "re-theming" the Arquette Arithmetic image. He also took the photos with the locals! This is what we mean when we ask you guys to get creative! 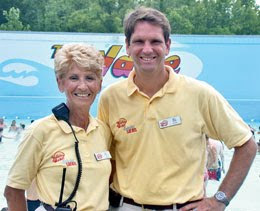 On this week's show, we take a break from our usual craziness to pay tribute to Will Koch, the president of Holiday World who passed away on Sunday at the age of 48. 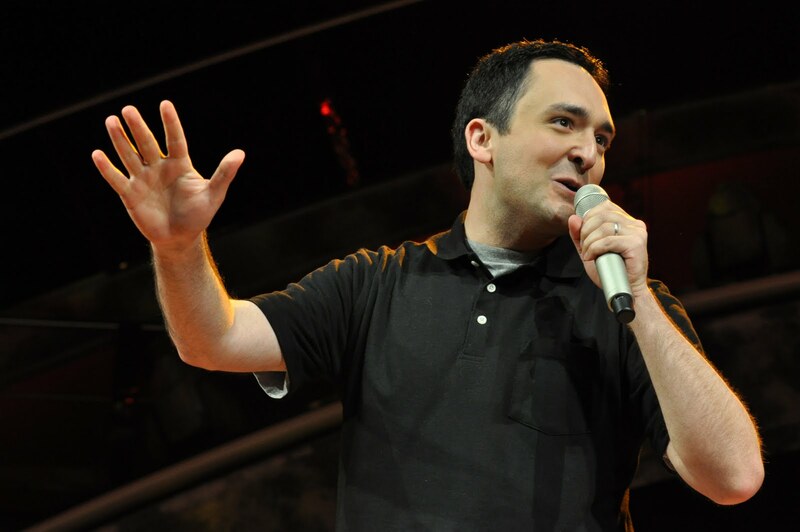 Will has always had a special place on this show because he was one of the first "big" guests that agreed to come on when we were first starting out back in 2005. Back then, not many people in the amusement industry wanted to deal with "the podcast guys." But Will came on CoasterRadio.com and was funny, candid, charming and extremely interesting. 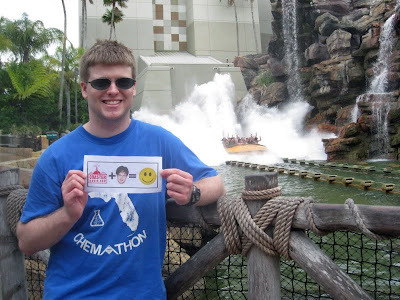 This week, we're replaying that interview as a tribute to Will. It's wonderful to hear him talk about the park that was his life and the creation of roller coasters that everyone knows and loves. His enthusiasm is contagious and the interview is one of our all-time favorites. As a way to say thanks, we're donating all of the website profits for the month of June to the Juvenile Diabetes Research Foundation in his name. 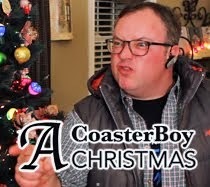 Everyone here at CoasterRadio.com sends our best wishes to Holiday World and the Koch family. When I woke up this morning and read the news about the passing of Holiday World's Will Koch, I had to read it two or three times before I believed it. Will's family believes he died of complications from diabetes. He was 48. EB interviewed Will just a few weeks ago about the opening of Wildebeest. And you guys will remember the classic interview we had with him back in 2005 about the Voyage. The thing that struck me most about that interview was how happy Will was about building The Voyage. He and his dad had always wanted to build a gigantic wooden roller coaster that would put Holiday World on the map. I could tell that he was thrilled beyond belief to do something that would make his dad proud. I have a feeling he's with his daddy today and they're both smiling. As expected, Holiday World will be open today. I figured that a nice tribute to Will would be to repost the interview we did with him back in 2005. 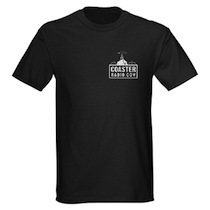 Talk about this in the CoasterRadio.com Fourms. Andrew created this video to show some hard evidence of David Arquette's love of theme parks! 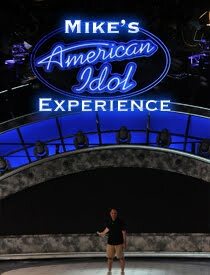 Over the last four parts of this story, you've read about my long journey to make it to the "American Idol Experience" stage. 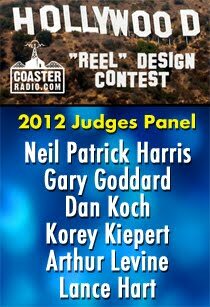 It started months before, when I decided to audition for the show and make it a long-running bit on the CoasterRadio.com podcast. So, it was very surreal to be standing backstage as the show began. Immediately off the left-hand side of the stage is a holding area where the contestants wait until it's time to go on. 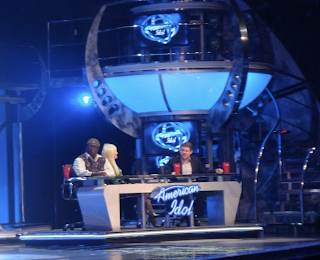 They have a comfortable couch, a large flat-screen TV where you can watch the show and a very cool "American Idol" logo light pointed at the ground where you are standing. "Stand-by to cue the host. All right everyone, please remain very quiet. We're LIVE in 3...2...1..."
Then, imagine my surprise when I looked up at the video screen and saw an old friend opening the show. "The Number One show on television continues its search for the next music superstar. But this time, we're taking you out of your living room and putting you in the middle of the action.... in an experience unlike anything we've ever done. Three Walt Disney World guests, just like you, hailing from across the globe, have made it through a grueling audition process and are now in the role of performer. And they're about to take their first important step towards pop stardom. 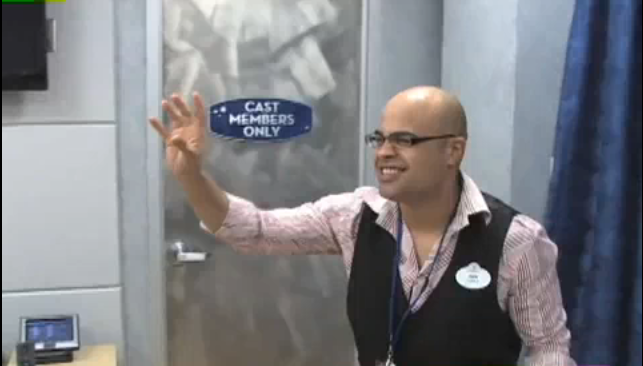 Live from Disney's Hollywood Studios, THIS IS THE AMERICAN IDOL EXPERIENCE!" 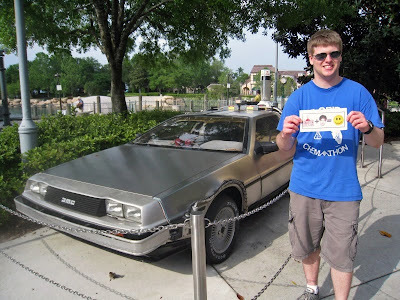 I must admit that it was a cool concept and a great way to tie in the real show with the theme park attraction. And it worked. The American Idol theme music started playing, the lighting on the stage came to life and the audience exploded into applause. They even put the names of the three contestants on the screen one at a time. I remember thinking that it was sort of strange, because who out there in the audience really cared who I was? But now that some time has passed, I think it's a great idea. The real American Idol show takes virtual unknowns and turns them into household names. This show manages to do the same thing, although on a much smaller scale. More on that later. I could see on the backstage TV that the host, Greg Hutson, had made his way onto the massive set. He was saying hello to the audience and explaining what was about to happen. 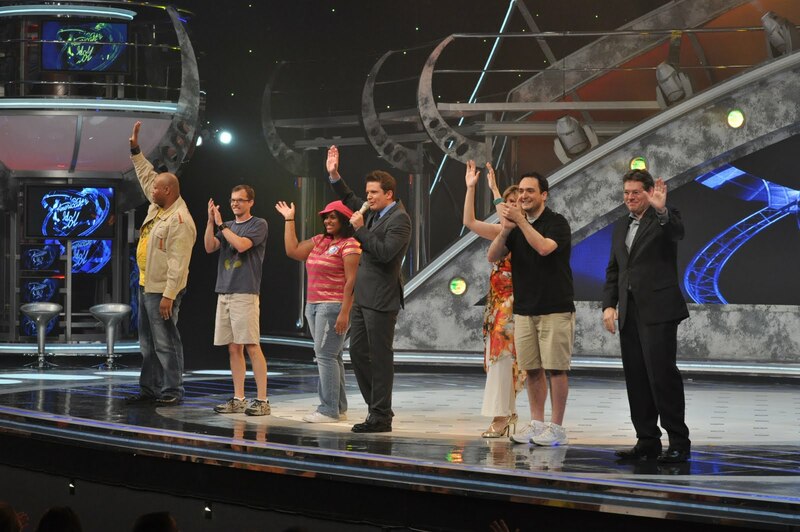 I was just starting to get into the show as an audience member, when we were quickly rushed over to the stage entrance. I had almost forgotten I was one of the "guest performers." Before I knew it, Greg said "Let's bring out the performers," and we were walking out on stage. 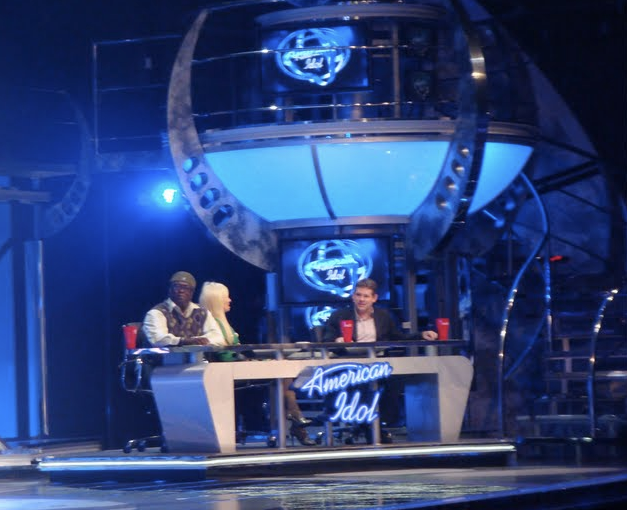 When we interviewed Stacey Lantz, an American Idol Experience contestant who had actually won her show, she said that the audience would respond to contestants who showed enthusiasm and who were excited to be there. 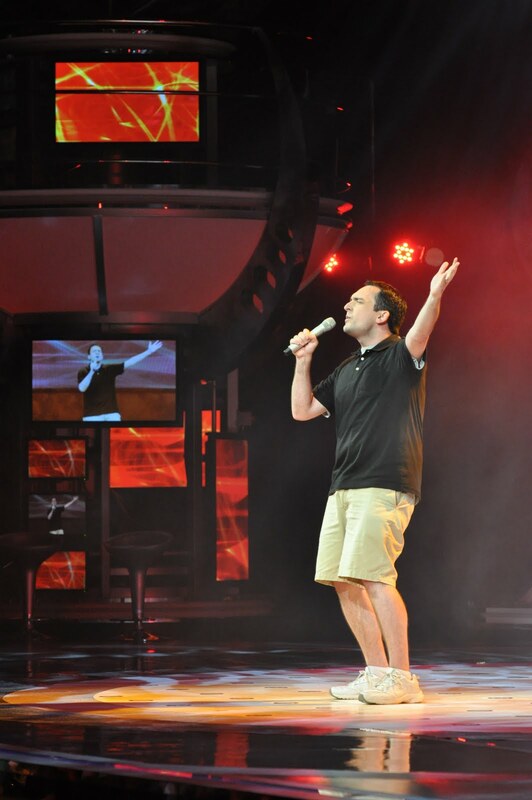 So, as I led the other contestants on stage, I pumped my fist in the air, pointed at the audience and smiled big. To my surprise, the audience was really cheering loudly for all three of us. Backstage, the producers said that the audience would be behind us and show us support. They were right! 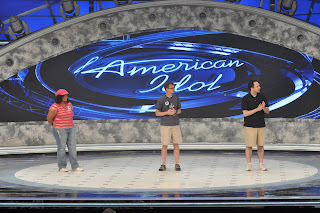 None of these people had ever met us before, but they had bought in to the whole idea of "The American Idol Experience." 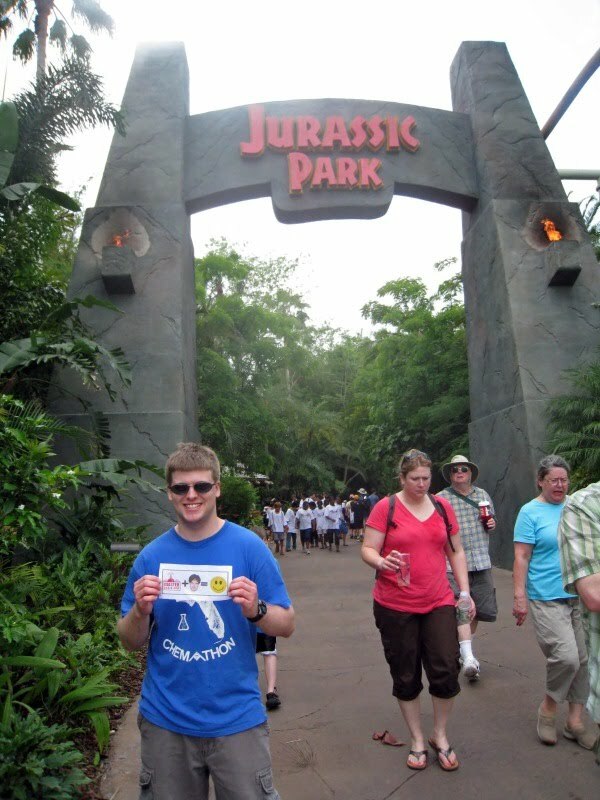 The audience liked the fact that we were three average park guests doing something out of the ordinary. 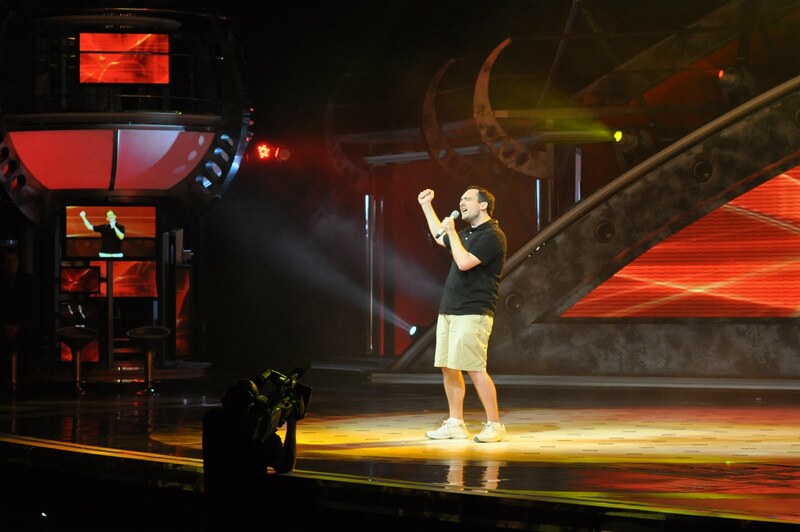 Greg explained that each of the contestants would sing and then the audience would vote for the best one by using a keypad built into their seat. The winner would move on to a finale show that happens at the end of the day. Here, the winners from all six preliminary shows would compete for a "Dream Ticket." This would give the winner a chance to skip to the front of the line at any American Idol audition throughout the country. Now, I'm 35-years old and past the American Idol cut-off age of 28. So I didn't have dreams of winning the golden ticket and becoming America's next pop superstar. At this point, I just wanted to do a good job and not make a complete fool of myself. The host had us go backstage and he introduced the three judges. 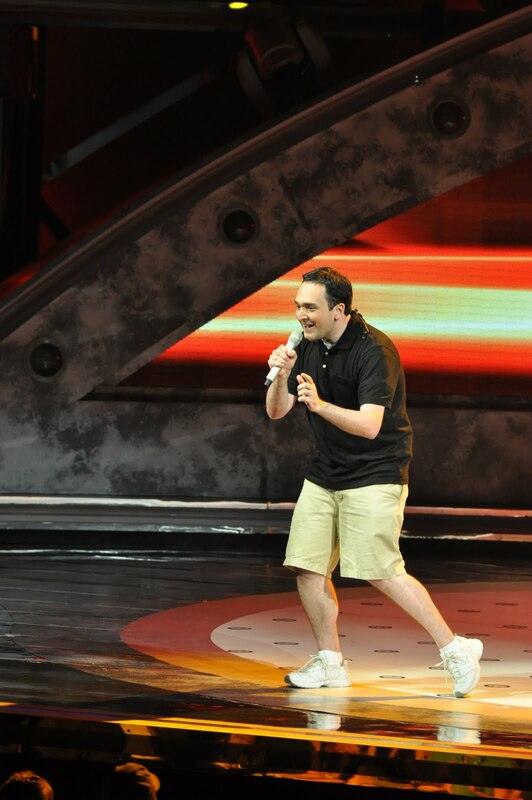 This is where the show becomes really fun for the audience. 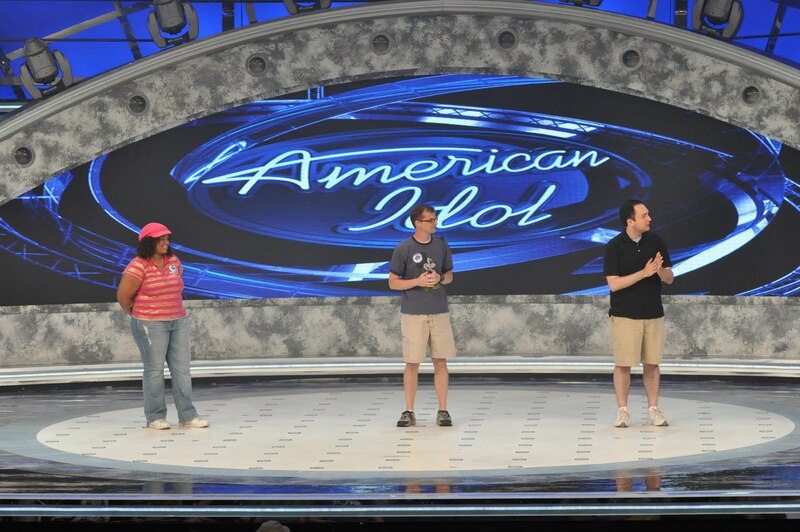 The judges, while not exactly carbon copies of the hosts on the American Idol Show, are pretty damn close. You have the music expert (Randy), the nice one (Paula/Kara) and the mean one (Simon). I was the third contestant, so my performance was going to be last. This gave me the opportunity to sit down backstage, relax for awhile and gear up for my song. The girl from Wisconsin went first and sang "No One" by Alicia Keys. Before she sang, they asked her who was her favorite American Idol. When she said David Cook, he magically appeared on the screen to give her advice. It was a nice touch and again tied the show in with the theme park attraction. She did a great job, but you could tell she was really nervous. The judges were all very nice to her, except for the "Simon" judge who gave her a backhanded compliment at the end. The Pastor from Houston was up next. Before his performance, they played a video where they showed him auditioning and celebrating with his family when he got through. He sang "Go the Distance" and did a really great job as well. The judges all liked what he did, except for the "Simon" judge. He said "since talent skips a generation, your kids are going to be superstars!" Ouch! Funny, but ouch! While the Pastor was being judged, the stage manager pulled me aside and reminded me of exactly what I needed to do and where I needed to go. She said "don't forget to breathe and don't forget to have fun!" Then, I heard Greg say "Let's welcome Mike Collins to the stage!" 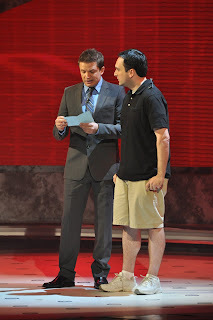 Since I was the third contestant, I got to sit down with Greg and do a short interview. This part of the set we were sitting on was pretty amazing... complete with a multilevel platform and several flat-screens. I didn't realize it at the time, but they were showing the Coca-Cola swish behind us... just like they do on the real show. 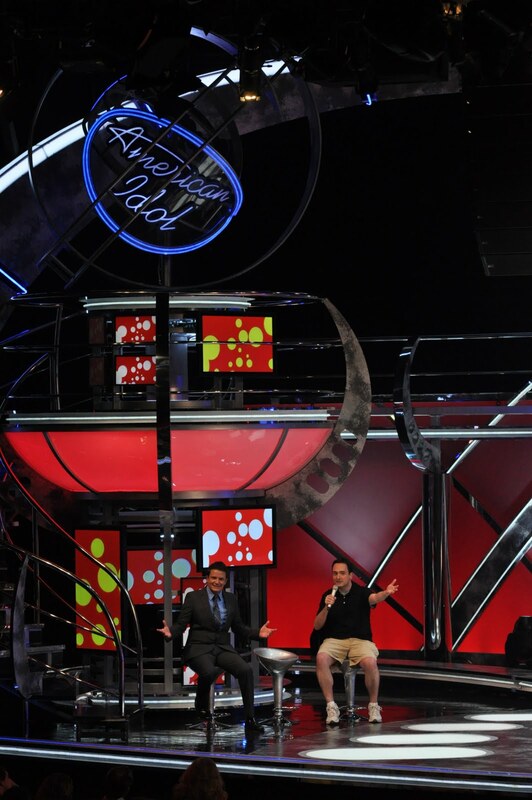 "Greg, I'm so happy to be here at the American Idol Experience! But I'm really happy to be performing in front of this beautiful crowd!" Yeah, it was a cheap move. But the audience liked it and applauded. Greg said, "Smart man! Getting the audience on your side early! Who are you here with today?" Then I pointed over to my brothers in the VIP section and said, "I'm here with two of the best brothers ever! Greg and Ryan! We came here in 1985 and we're back 25 years later! Look at them! They're beautiful!" I was going on like a maniac! The crew put a shot of Greg and Ryan on the big screens and they showed a mix of amusement and embarrassment. I was really laying the cheese on thick, but this was my moment... so what they hell, right? The host said that while my brothers were there along with the rest of the audience for support, there were also some other people who were in my corner. 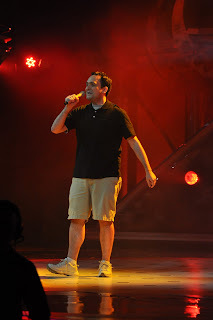 Then they showed a video of people outside the attraction chanting my name, "Mike! Mike! Mike! Mike!" They even had a little seven-year-old girl look at the camera and say "Mike is MY American Idol!" Very cute. The audience was eating it up! Greg the host then said, "All right Mike, it's time to show us what you can do. 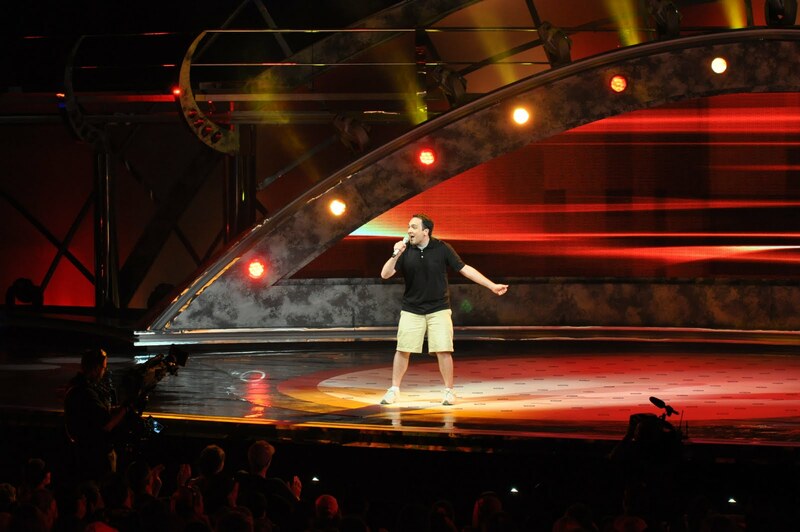 Here performing "Sway" is Mike Collins!" I had made my way to center stage and my song began. Now, maybe it's best to let the pictures tell the story. But let me say this. 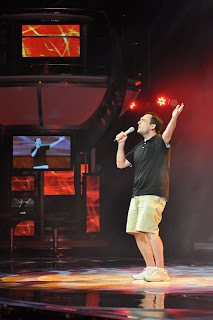 I've had the chance to perform on a lot of different stages, but none was better than this. 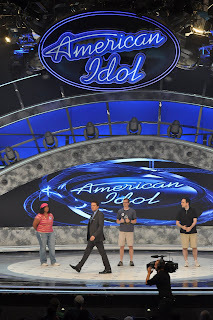 The lighting and sound system was EXACTLY what they use for the real American Idol show. I'm not sure if this will make sense to any non-performers out there, but I was actually able to draw energy from my surroundings. 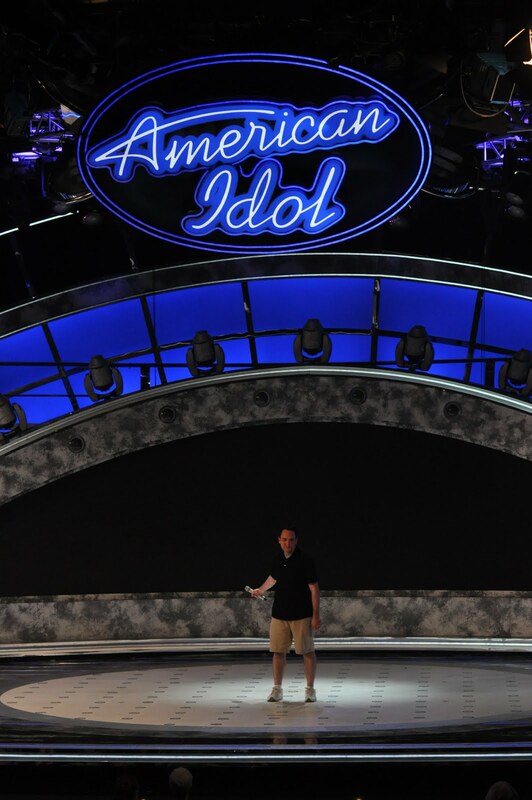 This was as close as I'd ever be to performing on American Idol, so I was going to make it count. I sang my heart out. I followed all of the advice of the coach who I had worked with 45-minutes earlier. 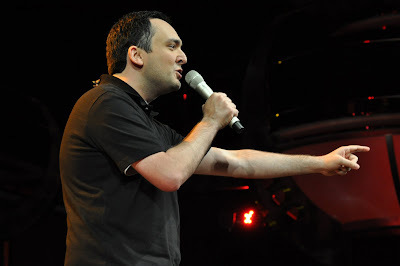 I pointed and winked at old ladies in the audience. I raised my fist in the air during high notes and closed my eyes and swayed during the "tender moments." I moved and performed with a purpose. 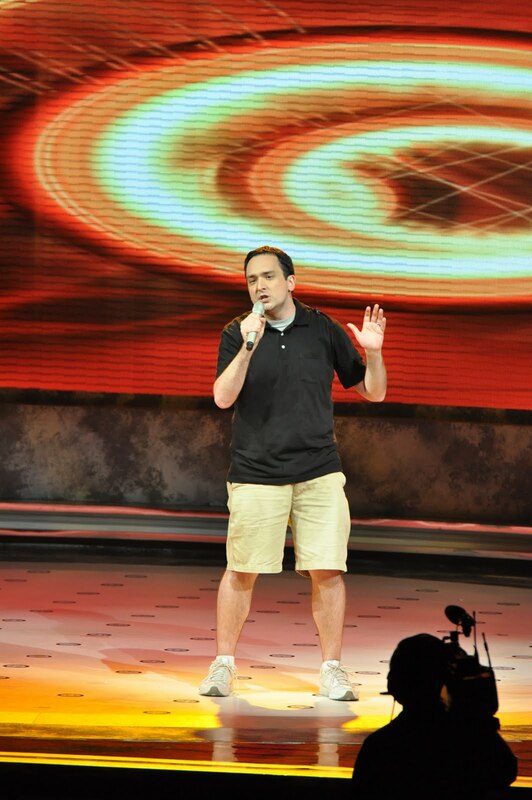 As I look at the photos, the only thing that takes me out of the moment is that I'm wearing shorts and sneakers. But you have to remember, it was 95 degrees in Orlando that day! 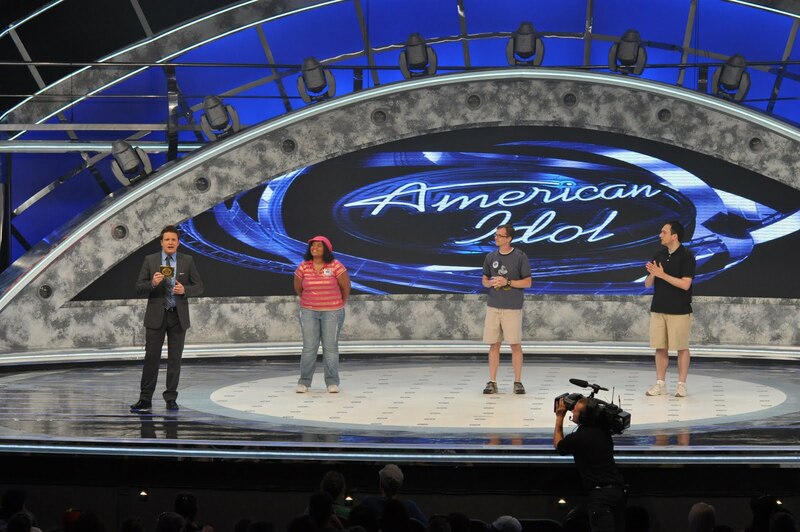 Our plan wasn't to do The American Idol Experience and go home. We were going to head out into the park after all this was over! So I wasn't going to dress in uncomfortable clothes. But now that I think about it, I wish I had brought a pair of jeans to change into. That would have completed the illusion. Anyway, if I had to grade myself on my performance, I'd give myself a B. I missed a few notes and could have done better on my last high note. 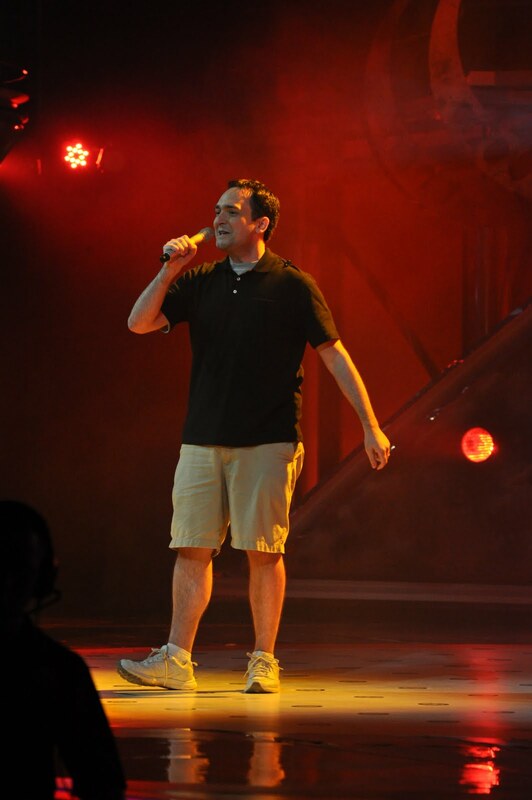 But having not performed on a stage in 5-years and with all of that Disney pressure, I think I did OK. The "Randy Jackson" judge said that out of all of the performers, I brought the most energy and brought the most fun to my performance. He also said that I sang one of the hardest songs they had to offer. The "Paula Abdul" judge said that she rememberd my brother from the earlier show and that it must be fun to come to our family reunions with all of the singing we do. She also said her one critique would be that I needed to dance around more and "shake what your mama gave you." "After watching your performance, I'm convinced that you could sing on any cruise ship in the world!" The coolest part is that the audience had my back. They booed the faux-Simon really loudly. But, It was a good dig. Very funny. I responded by glaring at him and pointing at my own two eyes and then back at him as if to say, "I'm watching you!" I continued to do this even as Greg, the host, was telling people to push the number 3 on their keypad if they wanted to vote for me. I could hear the audience laughing at my antics, which I hoped might get me a few more votes. 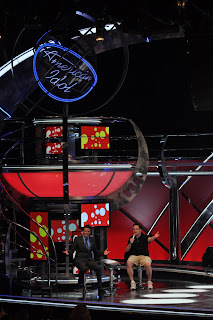 Now that my song was over, they brought the other contestants out again and we all sat down on the interview set. They played back 20-seconds from each of our performances to remind people of what we had done. It was really, really weird to see myself on video. 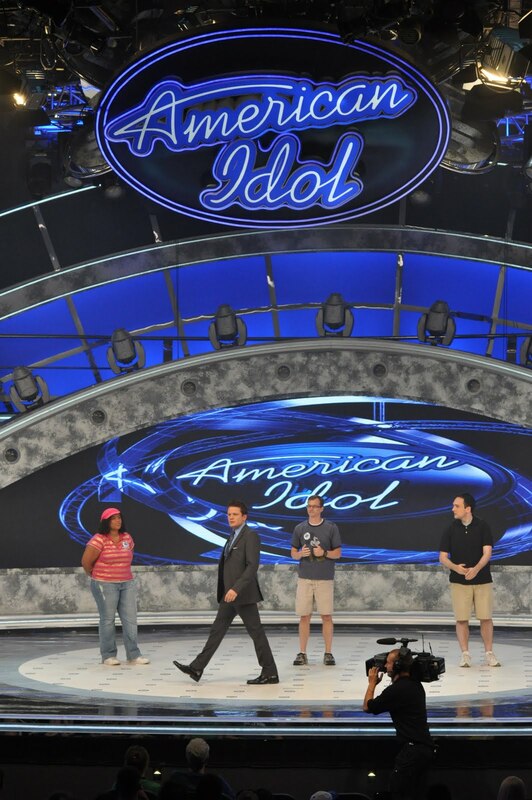 I had seen shots like this a hundred times on the real American Idol show. But this time, it was me! I was on the stage! 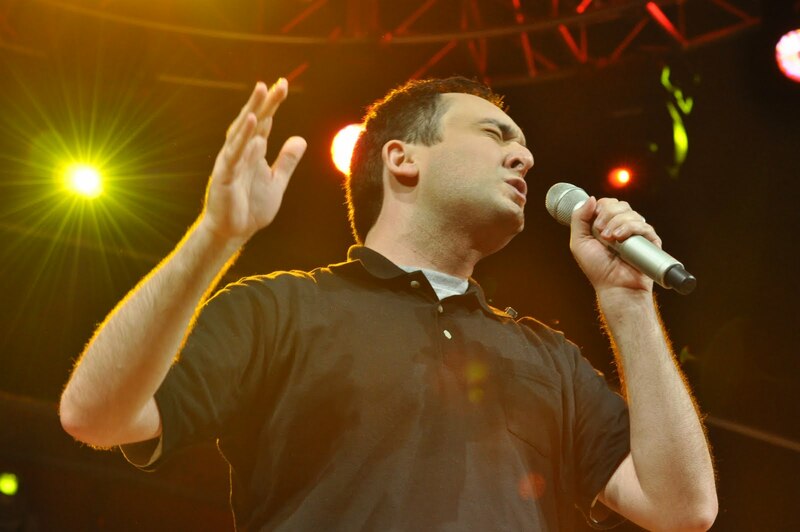 I was singing to an audience of 1,000 people. It was like being in a weird dream or even a nightmare! Then it was time for the audience to vote. 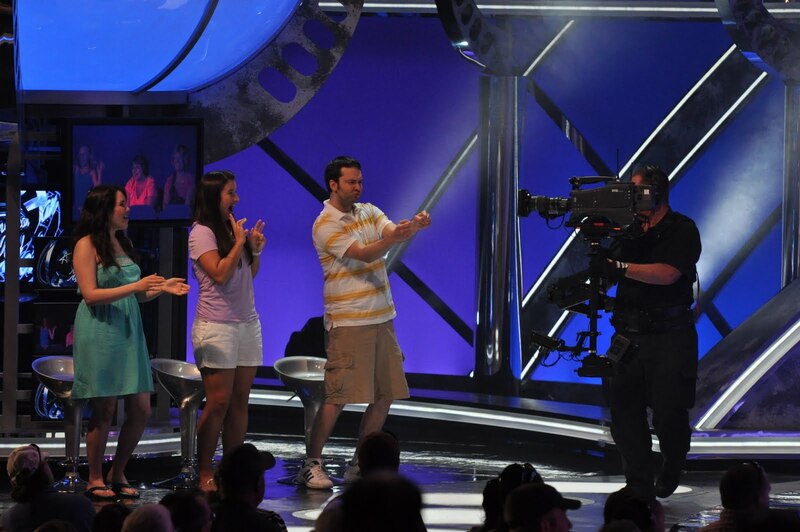 From my seat on the interview set, I could see that a lot of people had voted for contestants 1 and 2. But strangely enough, I saw that a lot of people had voted for me too! This was going to be close! While they tallied up the votes, they played a music video with Jordin Sparks that was shot on location at Disney's Hollywood Studios. 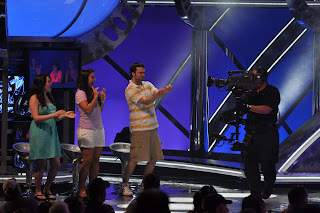 During the video, they cut in shots of the audience and even a shot of me lamely dancing. Then it was time to find out the results. 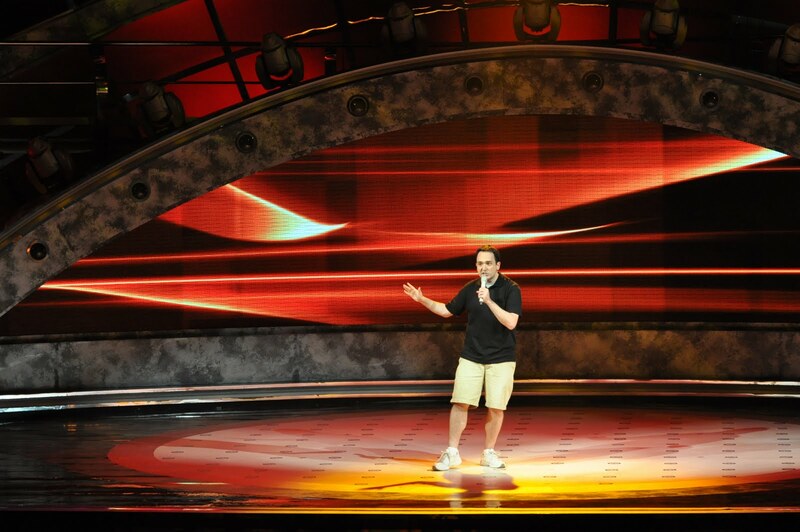 The host brought us all out to center stage and reviewed what the judges had said about our performances. Then it was time for the verdict. Greg did a great job building suspense and finally announced that the winner was..... not me. The girl from Wisconsin had won and deservedly so. She was good and actually looked like she belonged on American Idol. All of the judges came over to congratulate us, except for the "Simon" judge. I guess he was really into method acting because the dude stayed in his character throughout. The "Randy" judge came over and said that I had done a great job and should be proud. The "Paula" judge came over and gave me a big hug and said that I was one of the funnier performers that she had seen. When we got off-stage, the whole crew was there to congratulate us and tell us how well we had done. I was wanting to hang around and savor the moment, but they needed to get ready for the 3pm show. So, before I knew it, I was back outside the theater where my brothers were waiting for me. Here's where the most interesting part of this journey happened. Just like after Ryan's show, people were coming up to me to congratulate me on my performance. People were saying "I voted for you!" and "You should have won!" and "Don't listen to that Simon guy! He was a jerk!" One girl in her 20's, who was wearing the skimpiest tube top ever and looked like a supermodel, came up to me and gave me a giant hug while saying "You were the best!" I was so shocked I yelled "Oh My God!" which sent my brothers into hysterics. 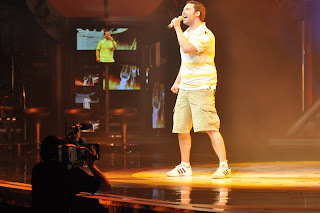 Thanks to the American Idol Experience, I knew what it must be like to be a rock star. But the taste of fame didn't end there, for the rest of our trip people recognized Ryan and me from the show. The next day we were in the elevator in our hotel and some guy pointed at me and said "Hey! Look! The American Idol guy!" While we were walking through Frontierland, a rough looking biker dude with a beer belly and a gotee stopped Ryan and said "Nice job singing yesterday buddy!" These were just two of several other instances like this during the days following our Idol performances. 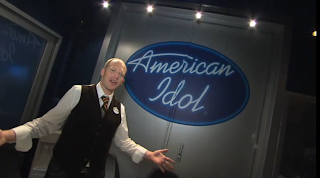 This made me realize what a unique attraction "The American Idol Experience" has become. It gives an average park-goer like me the chance to feel what it must be like to be an unknown one minute and then a star the next. It also gives the audience a chance to see how the number one show on television is produced. 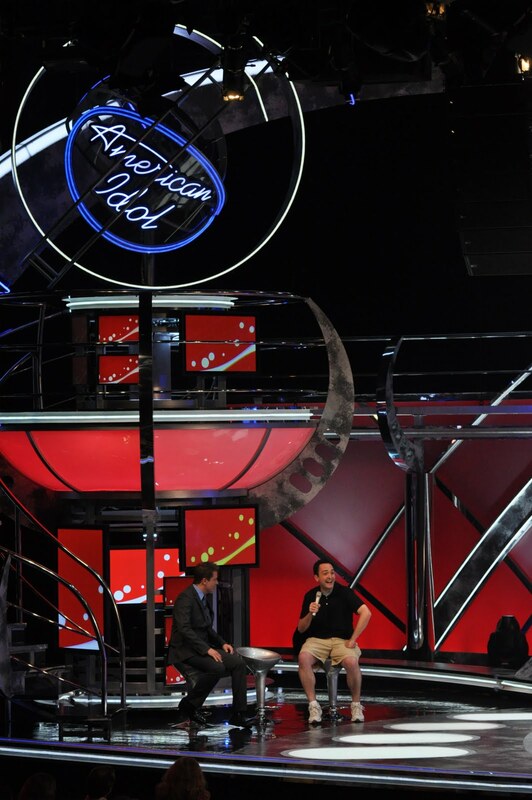 It's been about a month since I sang on the Idol stage. It was really one of the most memorable experiences of my life. It was exhilarating and terrifying all at once... a feeling I'm usually only used to experiencing on rides like Tower of Terror or Space Mountain. 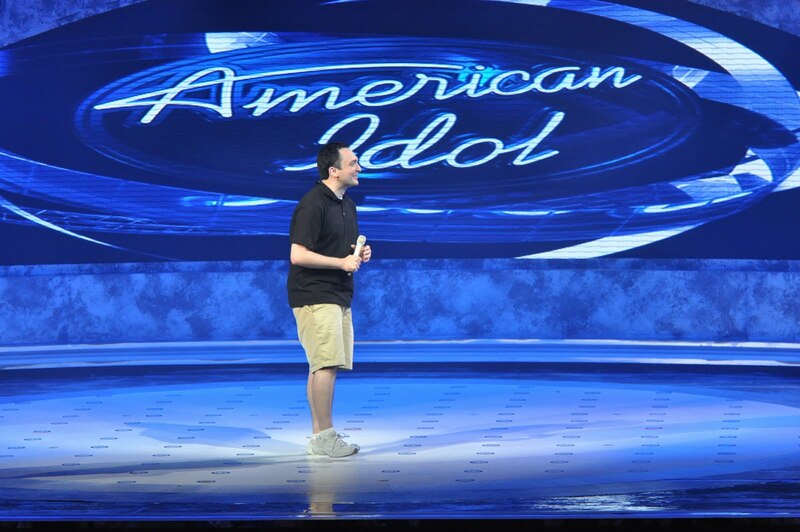 Amazingly, I found myself watching the last few episodes of American Idol this season. For some reason, I felt like I had something in common with those contestants. We all went through a similar "American Idol Experience." If you liked what you read, you can listen to the podcast episode where I tell the whole story! 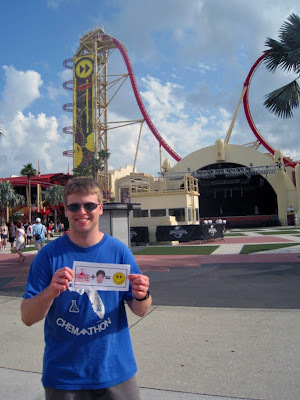 If you've read parts 1, 2 and 3 of my American Idol Experience saga, you know that we're just a few short paragraphs away from finding out what happened when I made it to the "big stage." When I last left you, both my brother Ryan and I had made it through the detailed audition process. I was scheduled to perform at the 2 pm show and Ryan was scheduled for the show at noon. One of the cool things about the Idol Experience is that they let the performer's family and friends come to watch the sound check and even give them VIP seating. 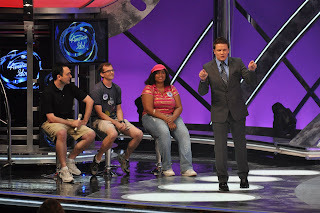 So, Greg and I headed for the "Superstar Television Theater" at 11:30 so we could be seated and watch Ryan's rehearsal. This was an excellent chance for me to see not only how the rehearsal worked, but also how a complete show looked from the audience's point of view. We sat in the VIP section with the families and friends of the other performers. I was happy to see that everyone was friendly to each other and supportive of all three singers. I think everyone was just thrilled to see their loved-one doing something so unique and exciting. Before too long, the sound check was over and the audience started to fill the theater. The show began and it hit me how close this show was going to be to the real thing. The Idol music, the lighting, the cheering audience, the Seacrest-like host. It was all so real! My brother did a great job during his show singing "Old Time Rock and Roll," a song that the producers hand picked for him. As good as he did, there was an 18-year old from Florida who blew the roof off the place when she sang "Colors of the Wind." Even though he didn't win, it was amazing to see people's reaction to him outside of the theater. Park guests were coming up to him, patting him on the back, shaking his hand and telling him what a great job he did. One little girl even came up and asked him for his autograph. Thirty minutes earlier, none of those people had any idea who Ryan was. 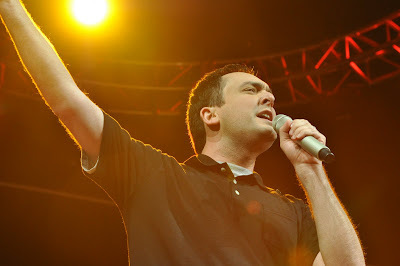 But after singing one song on that incredible stage, he was their "American Idol!" After a very quick lunch, it was my turn. 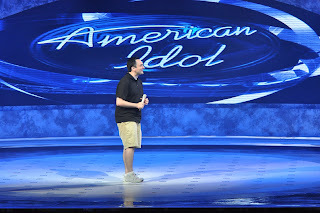 At 1pm, I showed up at the stage entrance to begin my American Idol Experience. 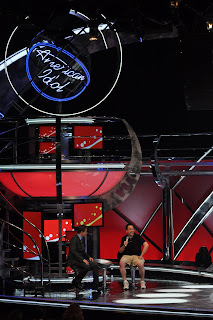 They brought me into the "green room" which was decorated in American Idol blue with a giant logo on the wall. Inside were comfortable couches, a water cooler, storage bins and a practice iPod for each contestant. Before long, the other two contestants arrived. The first was a young girl in her 20s from Wisconsin. The second was a guy in his 30s who was a church pastor from Houston, Texas. I was wondering what the other contestants would be like. Would they be nice? Would they be ultra-competitive? It turns out, they were two of the nicest people you could ever meet. The young girl was really nervous and the church pastor was giddy just to be there. The reason they had us arrive one-hour ahead of the show is so that each of us could spend time with a vocal coach and then have a professional stylist fix our hair and apply television makeup. The other two contestants went first, so that left me a few minutes to pick up an iPod and go over my song, "Sway." 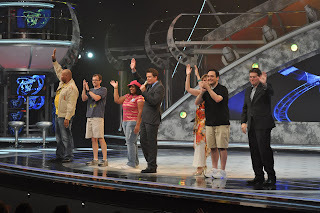 As I was scrolling through the songs on the iPod, I could hear the sounds of the audience applauding a contestant in the 12:00pm show that was going on at the same time. This is a good time to talk about the backstage crew and how excellent they were. There were several producers, a stage manager and an assistant who were helping to get us ready. 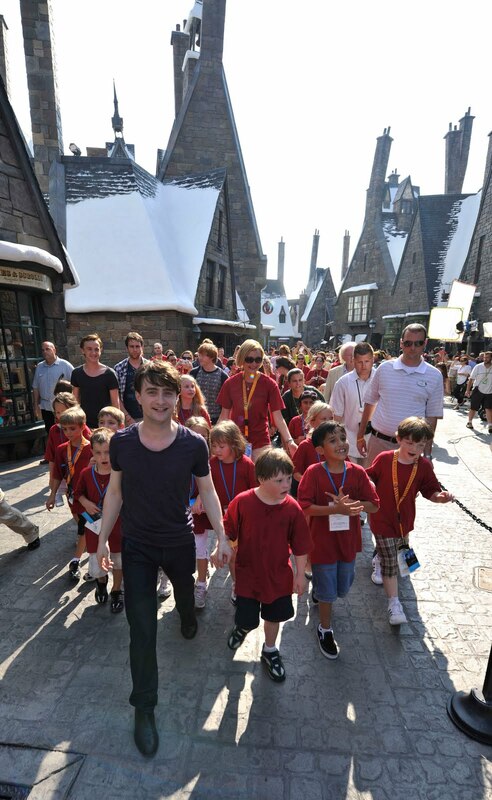 Throughout the whole experience, they did everything possible to make us feel relaxed. What I found incredible is that they kept us busy from the minute we arrived to the second the show started. I found this really helpful because I didn't have any time to get nervous. I was too busy focusing on everything that they had set out for me to do. Eventually, it was time for me to have my 10-minutes with the hair and makeup artist. Since I'm a guy, the artist said that there wasn't much that we needed to do. However, she did apply A LOT of makeup. I work in TV, so I know that you have to wear a lot of makeup when you go in front of the HD cameras. Next it was time for me to have a one-on-one session with the vocal coach. I walked into the rehearsal room which was covered in mirrors. It also had a piano and the same karaoke system that I used in the 2nd audition room. The vocal coach was excellent! He first had me sing the song so he could get a sense of what I could do vocally. As I sang, he was standing a few feet away shouting things like "YEAH!" and "ALL RIGHT!" I'm not sure if he was really impressed or just saying those things to give me some confidence. Honestly, it didn't matter, because it worked! He gave me some pointers and advice on a different way to sing some of the lyrics. He also gave me some tips on how to hold the microphone so that it would give the best sound. Next, he wanted to see how I "moved." 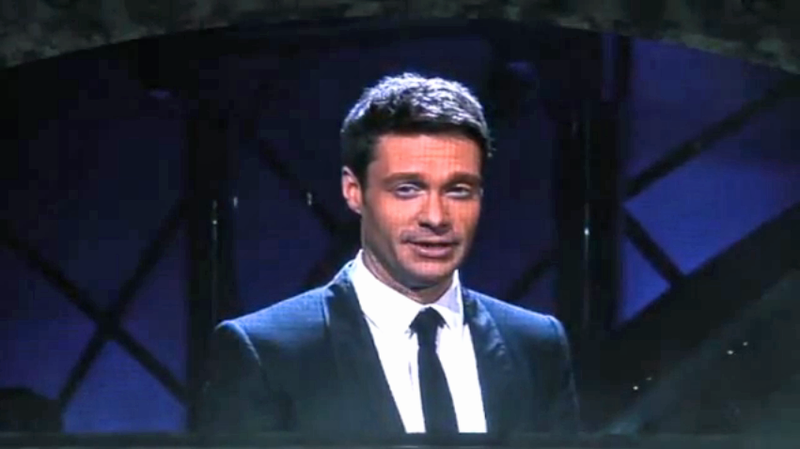 This was the toughest part for me, because honestly, I'm no Ricky Martin. But somehow I got over my embarrassment, because before I knew it, me and the vocal coach were dancing and singing together in that small, mirrored room.... and I was liking it. The coach gave me some more tips and said that the biggest mistake people make is to "wander around the stage." He said that I should "move with a purpose" and "move with the lyrics." He also explained where the cameras would be and how I should play to them if they came near. He said that he could tell I'd been on stage before, which made me feel like I could pull this whole thing off. He might say that to everyone who comes though, but damn it, it worked for my confidence. 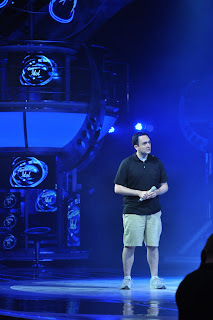 Next it was time to move onto the "big stage" for the actual sound check and walk-through of the show. I was blown away when I walked out there. The set is gigantic and multi-leveled. The theater is plush and state-of-the-art. As I wrote earlier, previous American Idol winners have performed on that very same stage and said that it was EXACTLY the same as the one in Hollywood. The stage manager and her assistant walked us through the entire show and explained what would happen step by step. They showed us where we needed to stand, where we could move on the stage during our performance and where we would sit during our interviews. They even fitted us with a wireless device so that the stage lights would follow us no matter where we walked. Awesome. Then it was time for sound checks. The girl from Wisconsin went first and sang "No One" by Alicia Keys. She sounded great, but she sounded like she was holding back. Next up was the pastor from Houston. He sang "Go The Distance" from Hercules and did a fantastic job. Then, it was my turn. The stage manager handed me the microphone, walked me out to center stage and pointed to a screen on the back wall of the theater. On the screen were the scrolling lyrics to "Sway," just as they had been in the audition and rehearsal rooms. 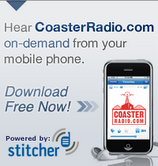 Now, because of my preparation on the CoasterRadio.com podcast, I didn't need the screen. I had the lyrics memorized. 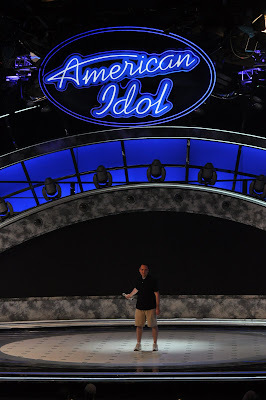 So it was time to see if I was able to do the song on the Idol Experience stage. The sound check was fun! The audio system in the theater is incredible. It was great to get an opportunity to hear what the room sounded like before doing it for real. It was also fun to see my brothers in the VIP section laughing and cheering me on. I also noticed that the vocal coach was sitting in the audience too! After the sound check, they took us to a comfortable holding area right off the stage. The vocal coach came back and gave each of us a few more pointers based on what we did during the sound check. Before long, I could hear the audience start to file into the theater. We were less than 15-minutes away from the start of the show. 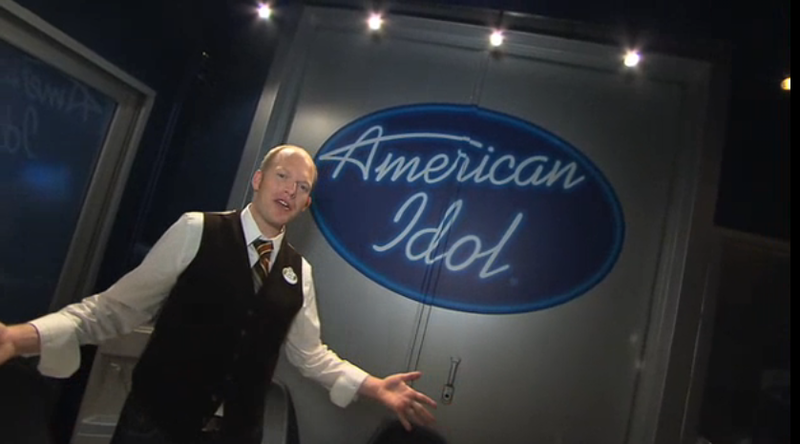 In Part 5, you'll hear what happened when I took to the American Idol Experience stage! By the way, if you don't want to wait for Part 5, you can listen to the podcast episode where I tell the whole story! Longtime listener Kevin from Florida and his girlfriend recently visited Universal Orlando.